have been born and spent my childhood. Marling (Marlengo) is my native village. It lies on the foot of the "Marlinger Berg"
near Meran at about 363 m above sea-level and has approx. 2000 inhabitants. health resort Meran, the villages Dorf Tirol and Schenna and mount "Ifinger". These are two pictures of Meran taken from the "Marlinger Berg". You can clearly see the (horse-) race course. Auer (Ora) is a small village at 50 km from Marling. I went to the "Agricultural" high school and lived there for 5 years. The "Etschtal"-valley is an immense apple-plantage. Aldein is my preferred holiday destination in South Tyrol. It is a small village, not far from Auer, at about 1.200 m above sea-level. holiday-cottage for the whole family-"Clan". a small lake in the forest reachable only by foot (20 min). formed this gorge in millions of years. Now it is known also as the "Canyon of South Tyrol". 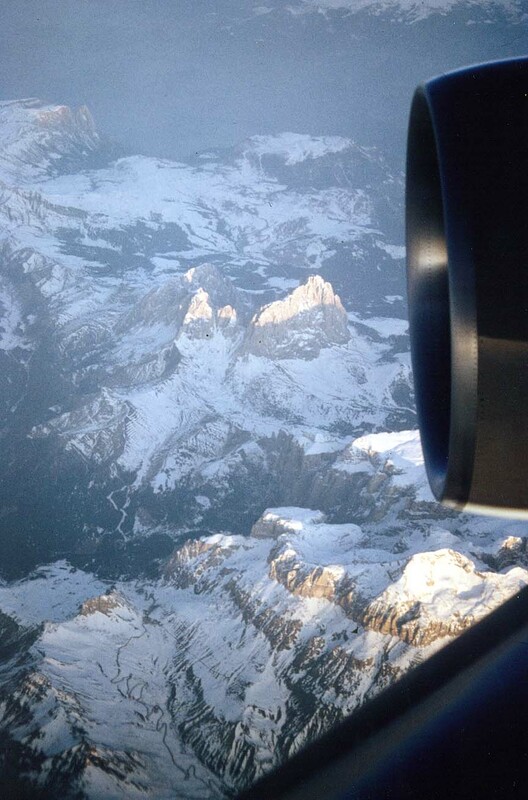 This is a very special photo of the Dolomite-mountains in South Tyrol. the "Langkofel", the "Schlern" and the "Pordoi-Joch"